Discover your own career path at Eastern Maine Community College — apply online today! Take the first step on a new career path and apply online! Your journey starts here! Get a jumpstart on a new career today — apply online for an education at Eastern Maine Community College! 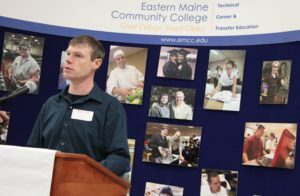 Get the education and experience you need at Eastern Maine Community College! Your journey starts here! EMCC welcomes all students, whether they are new or looking to transfer from another institution! Apply online for your next adventure with Eastern Maine Community College! 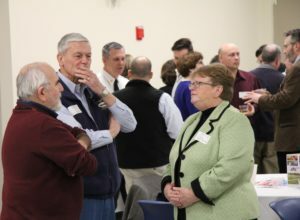 January 17, 2019 – Eastern Maine Community College (EMCC) was proud to host the annual Business and Industry Legislative Reception last night. The purpose of the reception is to bring all of our community partners together to see and to hear about their impact on students, programs, and the state workforce as a whole. 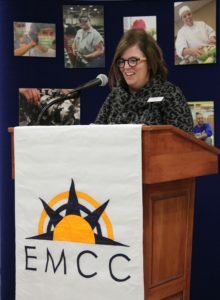 The strong relationship that EMCC has with Bangor-area and state-wide partners allows students to achieve a quality education that is affordable and flexible to them. President Larson expressed how successful many programs have been in the last year. For example, the Surgical Technology Program graduated 100% of their students and every single one of them secured a job. Outcomes like these are made possible by the support of dedicated faculty and staff, state of the art facilities, and engaged community partners ensuring that Maine’s workforce continues to grow and thrive. stay in Maine, making an education from EMCC a retention tool for workforce development. He also pointed out that he learned much more than complex electrical skills here, that without the small class sizes and attentive teachers, he would not have developed the confidence or the communication skills to be delivering a speech. That at Eastern Maine Community College students become well-rounded, productive members of our community and workforce. 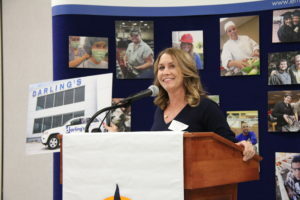 Carrie Meo the VP of Fixed Operations at Darling’s Auto Group spoke next about the importance of the hard trades, pointing out specifically the Automotive Program. She emphasized the importance in the dedication of EMCC’s Automotive Program to become a certified Mopar Career Automotive Program (CAP). As a CAP Program, their students gain a valuable certification that is desperately needed in garages all over the state of Maine today. 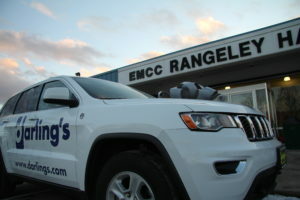 Meo expressed how proud she was of the EMCC Automotive Program, and how Darling’s Auto Group wanted to help improve their fleet of cars to work on. She presented, on behalf of the Darling’s Auto Group, a 2017 Jeep Cherokee to Rick Thomas, Chair, and instructors Christopher Davis and Jonathan Kill. President Larson, and the entire Automotive Department express their since rest gratitude to Darling’s Auto Group for their overwhelming generosity. 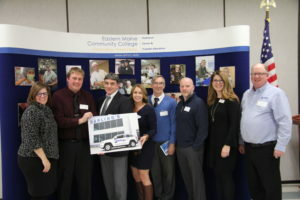 Their partnership with Eastern Maine Community College is invaluable to the success and growth of all the students who choose a career as an automotive technician and they look forward to working together in the future. EMCC would like to thank all of their industry partners who attended the reception last night and made it so successful. Copyright 2019 Eastern Maine Community College.